Nidhi Tiwari, successfully defended her PhD thesis on Thursday, 10 November 2016. She is the 50th graduate of the IITB-Monash Research Academy. She worked on a challenging optimization problem of improving the energy efficiency of large data centres without impacting their performance and availability. “We are dependent on Nature and its resources for our existence and well-being. The concept of sustainability, to my mind, involves doing more with less. The improvement in energy efficiency of the map-reduce clusters will, I believe, contribute significantly to the sustainability of data centers,” she said. “I feel blessed to have such an amazing family, inspiring supervisors and supporting universities and the Academy to have completed my PhD within the stipulated time,” she added. 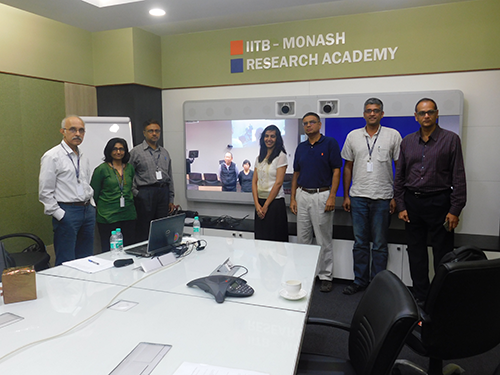 Nidhi was jointly guided by Prof. Umesh Bellur from IIT Bombay, Dr. Maria Indrawan-Santiago from Monash University), Dr. Santonu Sarkar from BITS Pilani and Dr. Anjaneyulu Pasala from Infosys. Prof. Bellur commented that ‘The defense went smoothly with Nidhi answering all the questions confidently’. Dr. Santonu Sarkar said ‘Nidhi’s work comprises of a massive experimental study. She performed it in a very methodical manner’.